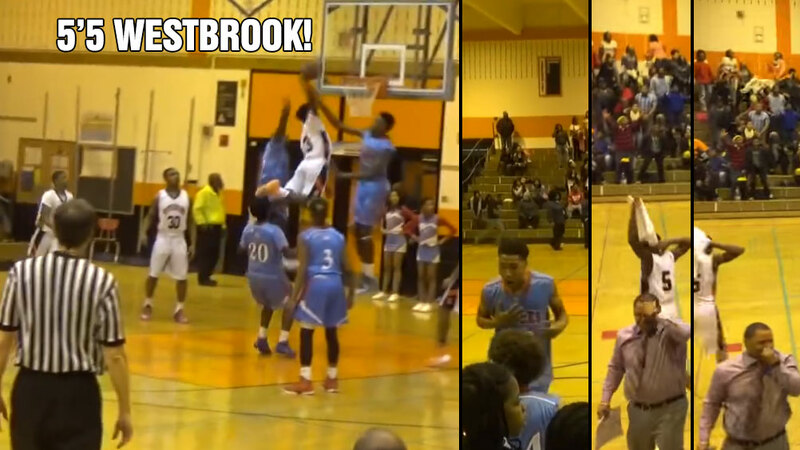 5’5 Melvin Lee Dunks On 2 High School Defenders, Coaches & the Other Team Go Crazy! People throw the term “shut down dunk” around too much. But when you are 5’5 and you throw down a Westbrook worthy dunk over 2 people then you threw down a shut down dunk; When your coach jumps off the bench and celebrates in disbelief then you threw down a shut down dunk; When the other team is giving high fives then you threw down a shut down dunk ; When you see a mascot talking to people in the crowd about your dunk then you threw down a shut down dunk; When you see the cheerleaders…whatever, they don’t know what’s going on and they kick and shout for any and everything. I think you got the point but if not, here’s another angle of Class of 2017 Melvin Lee’s dunk of the year nominee – watch the bench!